Victoria Legal Aid have been reviewing their grants procedure recently. We wrote about some changes back here. From tomorrow, people charged in the Magistrates’ Court with traffic offences under the Road Safety Act 1986 will only be eligible for a grant of legal assistance if they have a psychiatric or intellectual disability or an acquired brain injury, and a conviction is likely to result in a term of imprisonment, either immediate or suspended. When I read that advice on the VLA website, I assumed that those considerations were intended as an or rather than an and. That is, a person would be eligible for a grant of aid if they had serious mental health issues, or they were at risk of imprisonment. But I've since clarified that the criteria requires both: a grant of aid will only be available where a term of imprisonment is likely and the accused suffers from substantiated mental health issues. This is regardless of whether the accused intends to plead guilty or not guilty. The criteria won't be satisfied by a person simply saying they have such an issue. Only people who are receiving services from an approved mental health service under the Mental Health Act 1986 or is an eligible person registered under the Disability Act 2006 may receive a grant. Where a lawyer suspects that a person may have an undiagnosed condition, they'll be advised to go and seek assessment and treatment. VLA Duty Solicitors will continue to assist some people who are ineligible for a grant of aid, but their time will be limited. So, for example, if an accused comes before the court facing multiple counts of driving while suspended or disqualified in contravention of a suspended sentence for the same offence, no grant of aid will be available unless that person has a mental health issue. A duty lawyer might make the exceptional circumstances argument on their behalf, but with a very limited opportunity to prepare it. The most severe penalty I'm aware of in the Road Safety Act is for the offence at s 61 of leaving the scene of an accident where a person has been killed or seriously injured. The penalty is a maximum ten years in prison. In the Magistrates' Court the maximum penalty would be limited to two years, and it's likely that the most serious examples of that offence wouldn't be dealt with summarily. 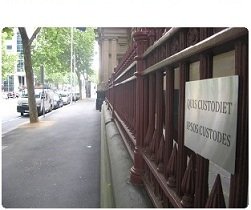 Will this policy decision lead to more Victorians being imprisoned? Only time will tell. Anyone facing imprisonment will still be represented in court, either by a legal aid lawyer or lawyer in private practice from our duty lawyer service, as the guidelines for this service are broader than those for a grant of assistance. The Duty lawyer Service is delivered by professional, skilled lawyers. They will continue to deliver a high quality service to accused, and we certainly don’t expect an increase in the numbers of people being imprisoned, as we have every confidence in the capacity and ability of the duty lawyers to help people. There is no time limit imposed on the time that a duty lawyer devotes to a matter: some people need only ten minutes, others need a lot longer. Duty lawyers will continue to allocate the necessary time to each matter to ensure that it is dealt with appropriately and professionally.